Dave: 361° is brand new to me. I’ve seen the brand in various run shops across the country in my previous work in the run sales biz. Early versions seemed quite stiff and heavy and as with most new brands, it needed work in my opinion. When receiving the Meraki however, I was very impressed with the aesthetics of this shoe. While the colorway I have may not be the coolest, the uppers are smooth and initial step in was extremely pleasant. My size 9, fit perfectly. The toe box allows just the right amount of splay for my average to narrow foot. 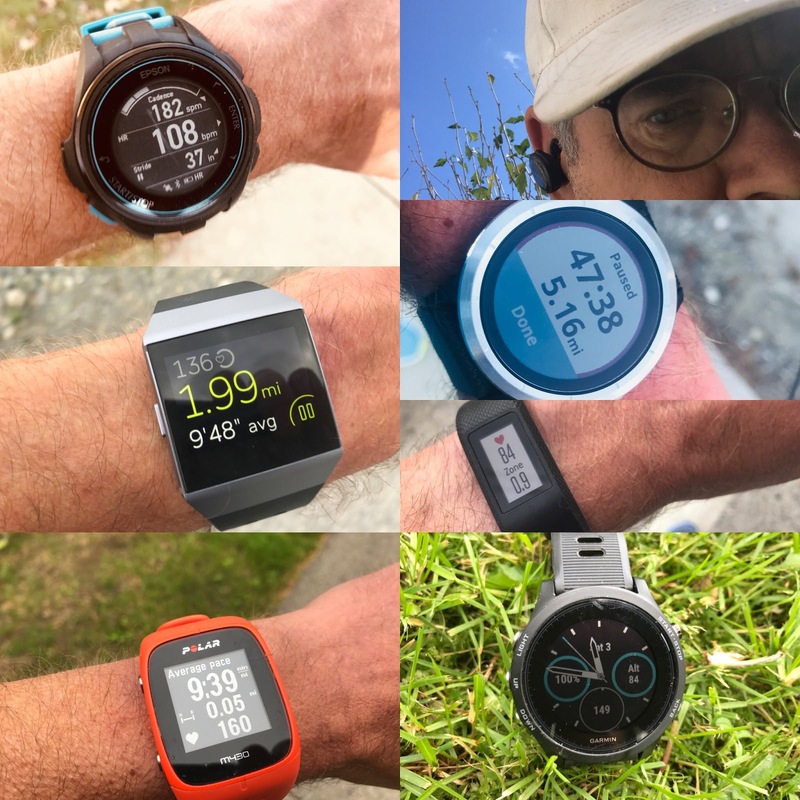 Sam: I had never run in a 361° before the Meraki and they have been a very pleasant surprise: agile, well cushioned, with very decent energy and response. I am going to second Dave on the fit. Perfect at my true to size with plenty of splay and what I always look for, a good hold from mid foot and laces to heel. The fit reminds me of a more spacious, particularly up front Brooks Launch. The colors are classic in blue and optic yellow. The upper has a depth of overlay detail which is highly functional but maybe a bit overdone in its visual complexity for me. 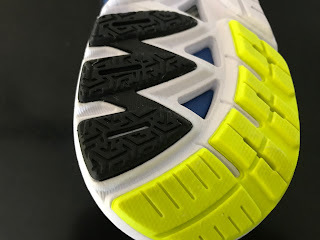 Talking to a 361 rep at a race this summer I learned that many former Asics folks are at 361 and as such their QuikFoam insole plus top sole in the midsole does feel a bit like GEL in its squishy bounce but in a more seamless way being right under the foot. It is certainly more noticeable as a component of the midsole, and a positive one, than Saucony's Everun top soles. 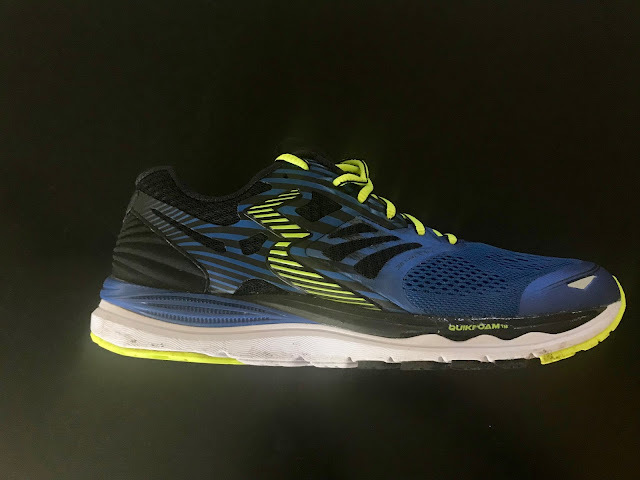 Sam: The upper is built in two distinct parts: engineered mesh up front and more conventional mesh with overlays to the rear. This two part construction is increasingly common in running shoes as it allows plenty of front of the shoe comfort while securing the mid foot and heel. 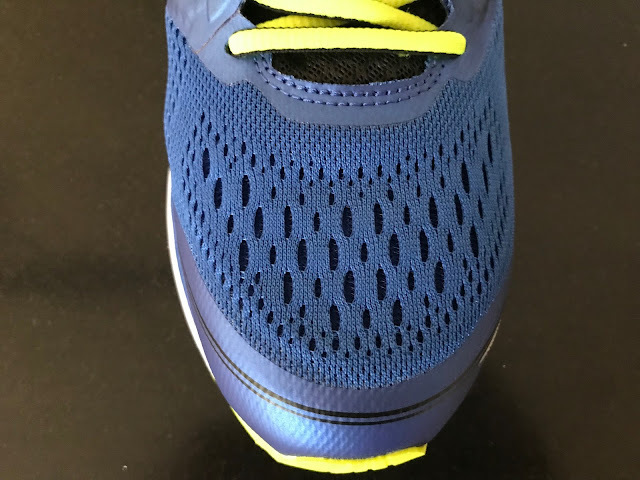 The front is a soft engineered mesh with no overlays over the always tricky metatarsal area. The fit is secure and more than decently roomy when the slight stretch of the soft mesh is taken into account. The rear is a conventional mesh with two weights of overlays. 361 calls this approach the Fitz Ride. The tongue is a lightly padded suede like material. It could use a bit more padding over the lace up but not a big issue. Insoles or sock liners can make a big difference in comfort and performance but are often an afterthought. Contributing to the step in comfort and taking the edge off shock, the insole is also made of 361's proprietary QuikFoam. It is a dense somewhat springier to the touch material than the usual. Pressing with a finger there is less of a sense of the material bottoming out. An exceptional insole I say! Dave: The upper on the Meraki is very nice. An area you can tell 361 has taken the time to really improve, as previous models over the last few years had a bunch of plastic overlays. The shoe molded to my foot very well. 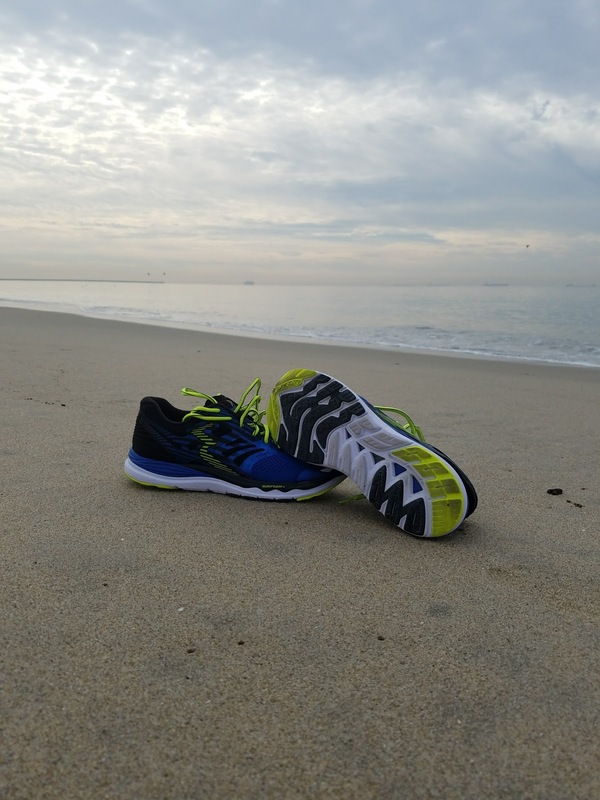 Sam: The midsole has an excellent blend of cushioning and is well grooved and cored out for smooth transitions. 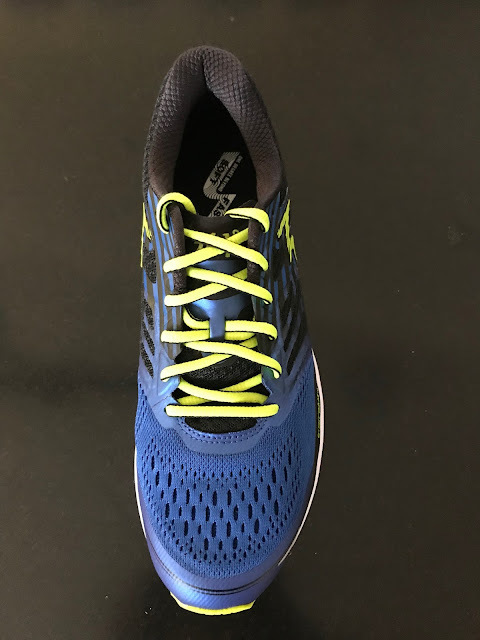 The QuickFoam top sole (black front and rear blue above) plus the QuikFoam insole give a slight squishy feel on landing to take the edge off the firmer EVA. 361 calls the combination QDP, Quick Dynamic Propulsion System, and mouthful aside it works as named. 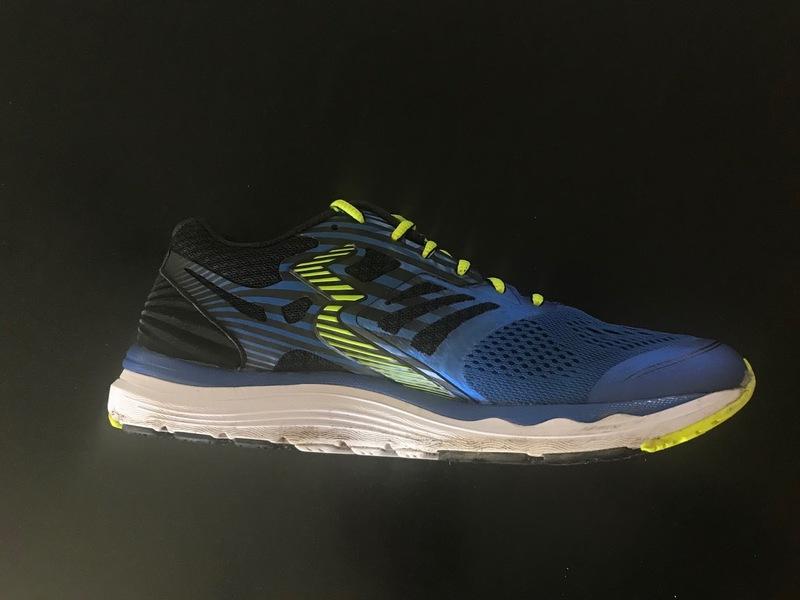 The midsole feels lower than the shoe's 9mm drop but unusually for this heel striker the sensation is not off bottoming out or rear shock. 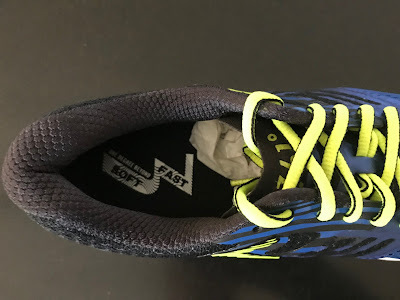 Again the QuikFoam may be part of what is going on, compressing more rapidly on impact, reducing shock before the lower firm EVA layer kicks in as transition off the heel starts. 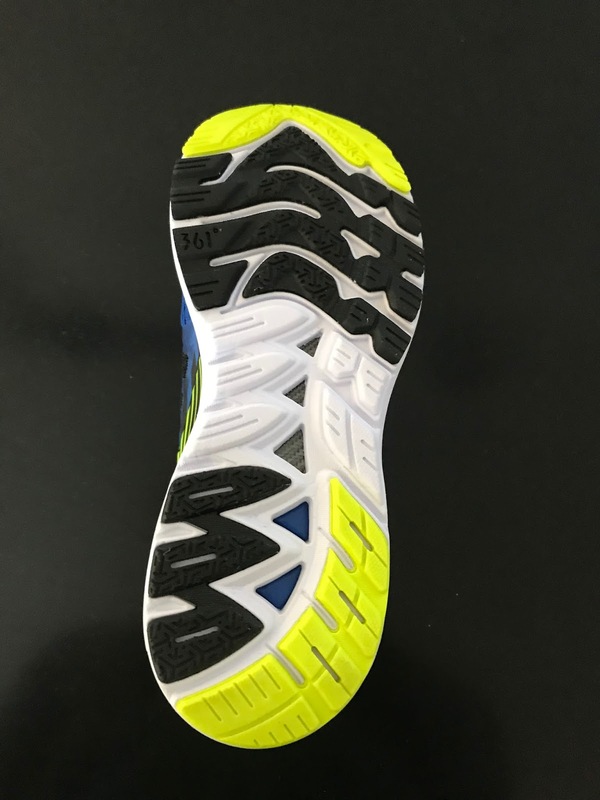 The rear cavity in the midsole, unlike many, is highly segmented I think contributing to both stability and also that smooth transition off the heel. The toe off is smooth and fluid. 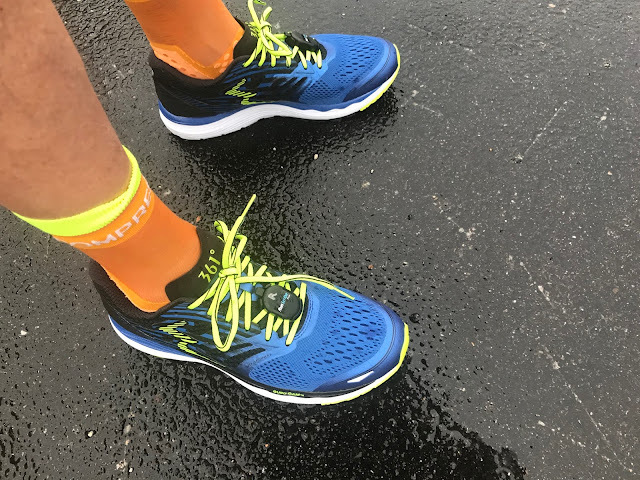 Dave: The midsole works with my foot extremely well, focusing and forcing a nice smooth heel to toe transition with my stride. 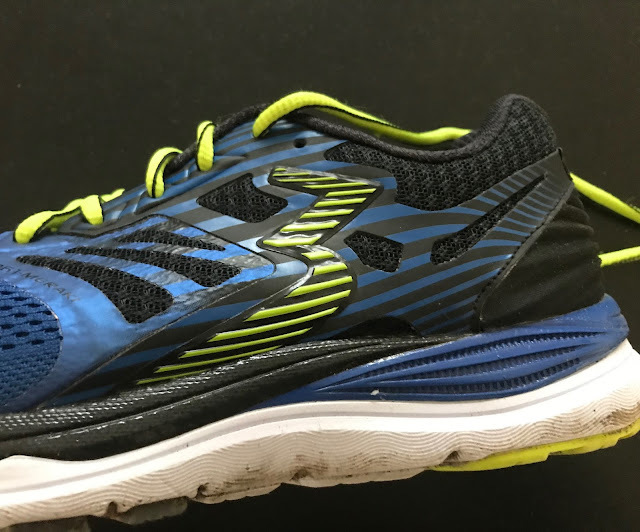 It is a tad stiff as I would like it to flex more like the M Strike in a Skechers Performance Go Meb Razor, but nothing I couldn’t get used to. It’s subtle and not overemphasized, which is key in my opinion to a good training shoe. Often times we see shoe companies with far too much midsole (ex: Wave Rider 21 etc.) causing a slappy ride. Sam: The outsole has 3 densities of rubber from what I can tell. All the rear areas are a firm durable rubber. The black section to the front is a somewhat softer than the usual blown rubber with the very front yellow a rubber somewhat softer than the rear rubber but firmer than the black middle sections. To date about 25 miles in I have seen no wear at all. Dave: I’m about 30 miles in on the Meraki with just some general aerobic miles and one tempo day. I have noticed no issues with wear and tear. 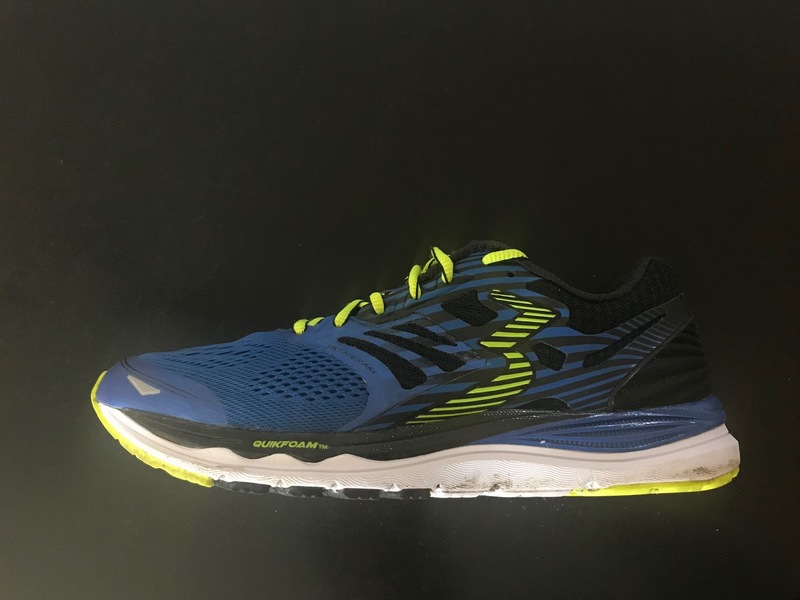 Given the more lightweight aspect of this shoe in terms of a daily trainer, I do however see the outsole wearing down after 200 miles or so. Durability wise I’m anticipating a 275 to 350 mile shoe, depending on biomechanics of the runner. Still, decent mileage for the $130 price point! Dave: The Meraki blew me away...honestly. I was not expecting much from 361. But run after run, they got better and better! The ride is super smooth and makes me want to continue to pull it to train from my already enormous shoe rotation. It’s just the perfect amount of cush, with a significant amount of forefoot pop. Get lazy or tired at end of a longer run and the heel cush is there to protect. Transition time from heel to toe is quick and efficient. Sam: Dave and I agree on the ride. Meraki is smooth and dynamic. This is not a soft cush ride. It is on the firmer side but in no way harsh. It is certainly not lumpy or overly firm either. I found the shoe most effective at slower tempo paces. Dave: Overall, a very very nice shoe! One that I think you will find yourself going back to again and again. The midsole, as stated earlier is a bit stiff, which could be softened up for my liking, but this wasn’t enough to make me dislike the shoe. If 361 can continue to make trainers of this quality then they are clearly onto something! 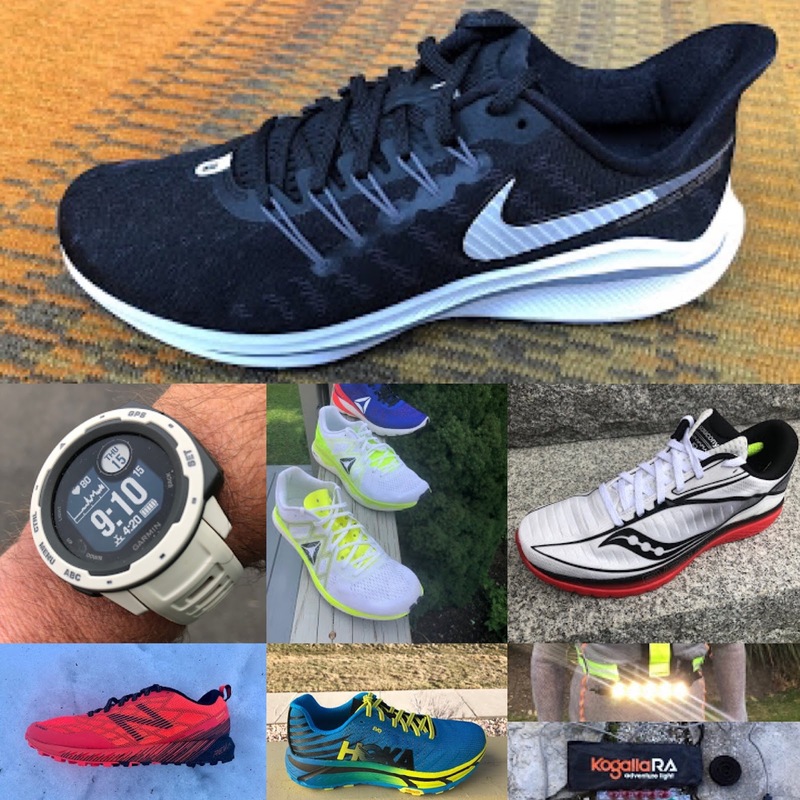 To me, the Meraki is a daily trainer that can also be used for uptempo days and a Fartlek sesh. It’s a tad too heavy to race or use on the track for some classic mile repeats IMHO. Sam: The Meraki was a big surprise. A fun, fast daily trainer with just the right combination of cushion, smooth transition, and pop. The upper is very comfortable and effective and the midsole outsole combination, if on the firmer side for a daily trainer, is just right for the bulk of my non recovery miles as I like a firmer ride with the edge off as I experienced with the Meraki. They run and are lighter than their listed weight and feel lower drop than 9mm too! A super smooth pleasant daily trainer. -.75 for a firmer midsole and colorway. Give these babies a try! It’s a head turner. I wish they were a touch more cushioned to increase versatility, maybe a touch more magic QuickFoam thickness? Dave: They both have that stiffer snappy ride, with more room for toe splay in the Meraki. The Vazee Pace isn’t as smooth on heel to toe transition. Dave: Both in my category of a go to daily trainer. I find myself using both for my bulk aerobic miles. Aesthetically, I like the looks of the Pegasus far better. The Meraki and the Pegasus 34, simply get the job done! Sam: Looks aside where the Pegasus is classier, sleeker and better looking with a perfect upper for me, I prefer the Meraki. I find the Pegasus, while also a dynamic fast trainer, more lumpy feeling overall with less road feel and stiffer in comparison due to the front Zoom Air unit causing a long and especially stiff flex, not something I do well with. Sam: While the Launch 4 is slightly lighter and the upcoming Launch 5 will drop yet a bit more I find the Meraki ride to be more dynamic overall with a smoother transition and while a bit less cushioned in feel considerably more energetic overall. Sam: The Ride 10 with very similar stats is one of my favorite daily trainers of 2017. It is a touch more protective and more flexible than the Meraki. While it has a fine forefoot upper, its engineered mesh is stiffer and not the silky well held comfort of the Meraki's. I might still give the Ride the nod as a single daily trainer for heavier miles but for a fun and dynamic ride and faster tempo paces the Meraki gets the nod. The Meraki provided at no cost.The opinions herein are entirely the authors'.